Apes socialize in packs, right? But yeah, it says a lot about Lily that not only does she refer to men as apes, not only does she stereotype their behaviour, not only does she make decisions based on those stereotypes, but that she views that sort of brutish, opportunistic mansplaining as the only form of male attention, as the essential type of male attention, and that, therefore, if Gina wants a man, that this must be what she wants. To be fair, though, Gina is a very passive person. Things happen to her. She is moved, she is convinced, she is pushed, she is told what to do. She doesn't have Lily's initiative/industry. She has to be goaded into things by other characters or by happenstance. Arguably, a proactive person pursuing her - whether driven by testosterone or by something else - might be exactly what she needs. 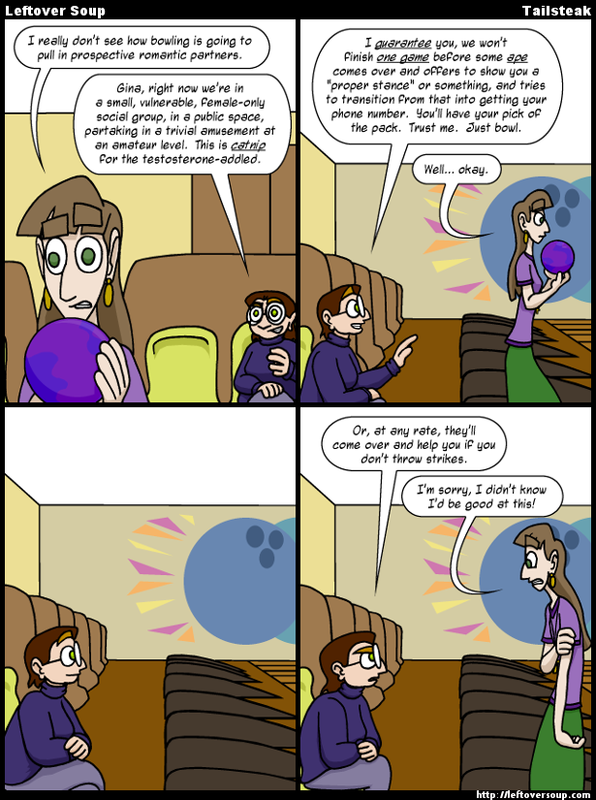 GU: I really don't see how bowling is going to pull in prospective romantic partners. LH: Gina, right now we're in a small, vulnerable, female-only social group, in a public space, partaking in a trivial amusement at an amateur level. This is catnip for the testosterone-addled. LH: I guarantee you, we won't finish one game before some ape comes over and offers to show you a "proper stance" or something, and tries to transition from that into getting your phone number. You'll have your pick of the pack. Trust me. Just bowl. LH: Or, at any rate, they'll come over and help you if you don't throw strikes. GU: I'm sorry, I didn't know I'd be good at this!